This section describes the decision process for identifying LNAPL concerns, verifying concerns through the application of threshold metrics, selecting LNAPL remedial goals, and determining LNAPL remediation objectives. These steps necessarily precede the selection of LNAPL remedial technologies, and the establishment of associated remedial performance metrics and remediation endpoints. This section also introduces remedial technology groups and the concept of a combined technologies approach. 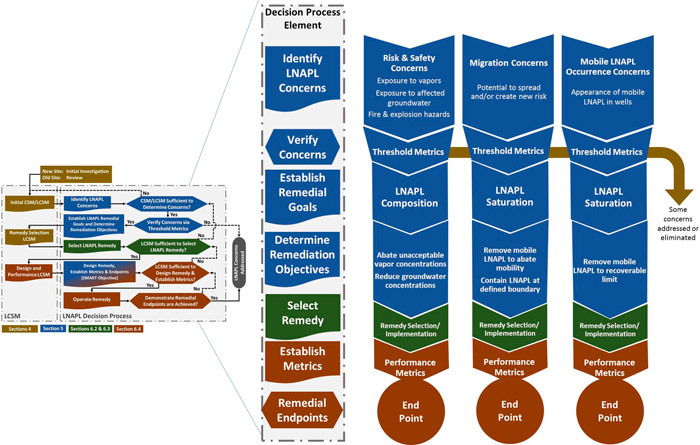 Figure 5-1 shows the process of identification and verification of LNAPL concerns, and the subsequent selection of remedial goals, remediation objectives, remedial technologies, remediation performance metrics, and remediation endpoints. The following subsections describes each of these steps. Figure 5-1. Decision process to identify/verify LNAPL concerns and establish remedial goals, objectives, technologies, performance metrics, and endpoints. create some other physical or aesthetic impact or other specific regulatory or stakeholder requirements. A well-developed Initial LCSM should summarize LNAPL conditions and guide the identification and refinement of LNAPL concerns. Some LNAPL concerns may be readily identified in the early stages of site characterization, and others may be identified or further refined following further development of the LCSM. Are there human or ecological exposures and risk concerns arising from the presence of the LNAPL? Are there potential fire or explosivity concerns associated with the LNAPL? Is there an ongoing LNAPL release? Is there potential for further LNAPL migration, which may create new exposures and risks? Are there LNAPL-specific regulatory requirements, such as removal of mobile LNAPL from existing wells to a defined threshold? Are non-risk odors or surficial stains from the LNAPL a potential nuisance? Are there geotechnical concerns due to the presence of LNAPL in soil? Is stakeholder perception of the occurrence of LNAPL a concern? The first three categories of concern are shown in Figure 5-1. “Other” LNAPL concerns are not explicitly shown in Figure 5-1, and are covered in less detail in the decision steps discussed below. Once identified, potential LNAPL concerns should be verified, because some concerns may be eliminated or managed without the need for remediation. As part of the verification process, LNAPL concerns may be compared to threshold metrics. A threshold metric can indicate whether an LNAPL concern may be eliminated, or whether it may be appropriate for carrying forward to establish remedial goals, complete a remedial technology selection process, establish remediation objectives, and lastly establish remedial performance metrics and remediation endpoints. In contrast to performance metrics, which indicate whether a remediation technology is progressing toward its remediation endpoint, threshold metrics are used to indicate whether remediation is warranted or if it can be managed without remediation. Not all LNAPL concerns will necessitate remediation; therefore, not all LNAPL concerns will generate LNAPL remedial goals and objectives. Verification of LNAPL concerns is a necessary step toward establishing LNAPL remedial goals and determining remediation objectives. The appearance of measurable LNAPL in a monitoring well may be identified as a possible mobile LNAPL occurrence concern, potentially triggering a regulatory requirement to recover LNAPL to the extent practicable. An appropriate verification action would be to compare the measured LNAPL transmissivity in that well to a threshold metric, such as the ITRC-recommended LNAPL transmissivity endpoint range for LNAPL recoverability. If the measured LNAPL transmissivity exceeds the recommended endpoint range, the mobile LNAPL concern would be considered verified, and carried forward for remedial goal and objective development. Buildings overlying an LNAPL body may be identified as a potential petroleum vapor intrusion (PVI) concern. This concern may be verified by comparing the vertical separation distance to the applicable risk-based screening distance (ITRC 2014) or other risk-based screening criterion1. If the screening indicates that there is a potentially complete exposure pathway (current or future) that could result in an unacceptable risk, then the LNAPL PVI concern is verified, and the concern would be carried forward to select remedial goals. A potential LNAPL migration concern has been identified at a large LNAPL body. One threshold metric that could be applied to verify this concern is an assessment of LNAPL body stability using existing site monitoring data. If the LNAPL body can be demonstrated to be stable or receding, the concern for LNAPL migration can be eliminated. Conversely, a site with a documented expanding LNAPL body and/or visible LNAPL seep(s) would be carried forward to remedial goal selection. A potential concern about near-surface occurrence of LNAPL has been identified at a site with historical surface releases. The state has numerical limits for TPH in shallow soil based on a theoretical threshold for the occurrence of a separate phase (Csat). Comparison of soil sampling data for TPH in soil to state numerical TPH standards can be used to validate or eliminate this concern. Once LNAPL concerns have been evaluated, those that have not been eliminated or managed without remediation are considered in the selection of LNAPL remedial goals (Figure 5-1). Once LNAPL concerns have been verified, appropriate LNAPL remedial goals are established to address those concerns. LNAPL remedial goals are the desired LNAPL condition to be achieved by the remedial strategy or action that constitutes the end of LNAPL management for a specific LNAPL concern. The elimination of the LNAPL concern necessitating LNAPL management occurs when the goal is achieved.. Because more than one LNAPL concern may need to be addressed to render the site protected, multiple goals may be established so that the different concerns are eliminated. For example, if there are three LNAPL concerns at the site, then three LNAPL remedial goals may be selected – one to address each concern. LNAPL risk concerns typically generate LNAPL composition-based goals. LNAPL migration concerns typically generate LNAPL saturation-based goals. Mobile LNAPL occurrence concerns typically generate LNAPL saturation-based goals. “Other” LNAPL concerns typically generate LNAPL aesthetic goals. A compilation of example concerns, potential threshold metrics, and remedial goals is shown in Table 5-1. An LNAPL Remediation Objective describes how the remedial goal will be accomplished and must be linked to the technology(ies) to be used. Combined with performance metrics and a remediation endpoint (Section 5.5), the LNAPL remediation objective becomes a “SMART” objective (Specific, Measurable, Attainable, Relevant and Timely). LNAPL remedial goals are grouped in Table 5-1 by those that address LNAPL Saturation, LNAPL Composition, and LNAPL Aesthetics. LNAPL remediation objectives are closely linked to goals within those groups. Specifically, the remediation objective articulates the action required to address specific LNAPL remedial goals. When stating an LNAPL remediation objective to accomplish a specific LNAPL remedial goal, the objective typically includes one of the phrases: “stop,” “abate,” “control,” “change,” “reduce,” “remove,” or “recover.” Articulating objectives with these words help connect the remedial goals to one of the technology groups described in Section 5.4. Therefore, for specific, agreed-upon LNAPL concerns and LNAPL remedial goals, remediation objectives can be defined. Example remediation objectives are included in Figure 5-1 in association with the concerns and goals to which they relate. Figure 5-2 illustrates the LNAPL decision process with specific examples. Figure 5-2. Example LNAPL decisions for verified LNAPL concerns. Careful consideration and linkage of LNAPL concerns, goals, and remediation objectives is essential. For example, if the concern is “LNAPL is the source of the dissolved plume” and the goal is “to reduce the dissolved phase COCs from the LNAPL source” (a composition goal), then an objective of “removal of LNAPL with hydraulic recovery” would not address the concern or meet the goal, because LNAPL mass recovery addresses saturation, and not composition (see Figure 5-3). LNAPL concerns can also be mitigated by implementing institutional controls (ICs) or engineering controls (ECs). It is a site-specific decision to choose between IC, EC, or remediation technologies. This guidance focuses on remediation technologies. A specific technology may not necessarily be a pure end member of any particular technology group. For this reason, a ternary graph is included in Table 6-1 for each technology to represent visually how the technology associates with the technology groups, which are described below. LNAPL mass-recovery technologies address saturation-based LNAPL remedial goals and are the technologies most frequently used exclusively for LNAPL remediation. These technologies recover LNAPL via physical removal, such as with excavation of LNAPL-saturated soil or hydraulic recovery (e.g., LNAPL pumping or skimming). Hydraulic recovery may be pursued with or without flow augmentation using remedial techniques that reduce LNAPL viscosity or interfacial tension (e.g., surfactants or solvents), thereby enhancing LNAPL mobility flow characteristics. Subject to logistical and practical limits, LNAPL mass recovery using pumping or skimming technologies is limited to reducing LNAPL saturation to residual saturation. One exception is excavation, which can achieve complete LNAPL removal. At residual saturation, LNAPL will not flow and, therefore, hydraulic recovery is no longer possible (see Section 3.6 for more details on the limit of hydraulic recovery). LNAPL phase-change technologies do not directly remove LNAPL from the environment as is the case for LNAPL mass-recovery technologies. Instead, LNAPL phase-change technologies rely on the physical properties (e.g., vapor pressures, Henry’s Constant, solubility) of LNAPL to partition from a multi-constituent liquid to other phases by increasing the rates of volatilization, dissolution, or degradation of the LNAPL constituents. Those LNAPL constituents are either degraded in situ or captured and treated in the vapor or dissolved phases as they are removed from the subsurface. The composition of LNAPL changes through the removal of LNAPL constituents that readily degrade, volatilize, or dissolve. LNAPL phase-change technologies are thus primarily applicable to composition-based LNAPL remedial goals. LNAPL phase change results in some saturation reduction (e.g., SVE for gasoline LNAPL can reduce overall LNAPL saturation), therefore these technologies may have some secondary application for saturation-based LNAPL remedial goals. LNAPL phase-change technologies are not limited by residual LNAPL saturation because they do not depend on the presence of mobile LNAPL. Some LNAPL phase-change technologies are more elaborate to design and implement than LNAPL mass-recovery technologies, and their practicable limits may not be as well established as those of LNAPL mass-recovery technologies. Thus, LNAPL phase-change technologies may be costlier to design and/or deploy, but use of strategic/targeted applications may minimize such limitations and possibly shorten the LNAPL phase-change remediation life cycle. 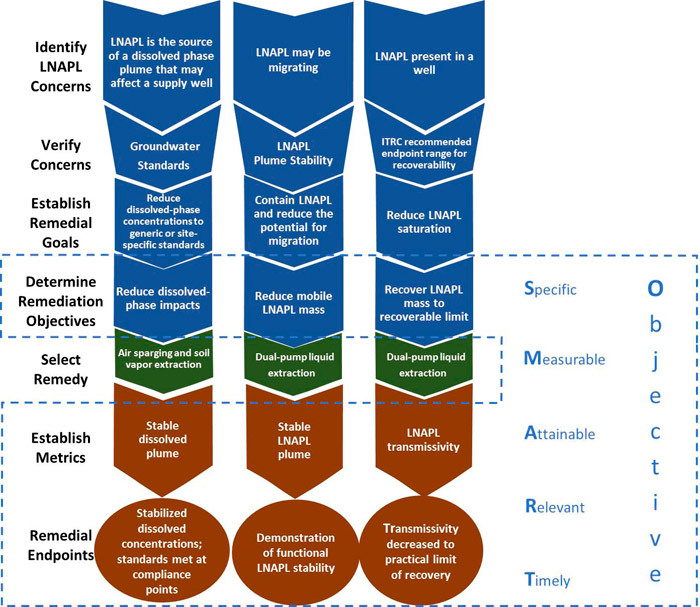 For example, to achieve a remedial goal of LNAPL recovery to saturations less than residual, it might be more appropriate to hold off deployment of the LNAPL phase-change remedial technology until after an LNAPL mass-recovery technology has reached its recovery limit, or an LNAPL remediation objective is reached that is set to transition between the two technologies. LNAPL mass-control technologies are primarily suited for saturation-based LNAPL remedial goals because they limit mobility or eliminate migration. LNAPL mass-control technologies may stabilize a migrating LNAPL by reducing the LNAPL saturation via blending a binding agent with the LNAPL zone (mixing technologies) or by physically blocking LNAPL migration (containment technologies). Such technologies alone may satisfactorily meet the remedial goal or can be used in combination with LNAPL mass-recovery or LNAPL phase-change technologies. Additional long-term operation and maintenance and stewardship requirements may also be warranted, depending on site conditions and property use. The containment technologies are limited in applicability to LNAPL saturations in excess of residual saturation, since at residual saturations the LNAPL body is, by definition, immobile. In some instances, mixing technologies may also reduce cross-media impacts (e.g., recharge infiltration and leaching through the LNAPL zone) since some binding agents (e.g., Portland cement, bentonite) can reduce the soil permeability of the LNAPL zone or degrade the volatile or soluble LNAPL constituents. An effective remedial strategy depends on the optimum use of technologies to maximize LNAPL removal at the lowest cost and effort while achieving remedial goals. Formerly, LNAPL remedial designs used a single technology to remediate an LNAPL source or plume or both, with the expectation that the technology would achieve the remedial goal over the course of the design life cycle. Experience has shown this has not always been the case as remedial systems were found to be ineffective and costly while regulatory closures were not achieved. Based on lessons learned from this practice, a single technology approach may not be the most practical or cost effective for LNAPL management and remediation. A more practical and cost-effective strategy may be to sequence and/or combine technologies at different stages of the remediation life cycle based on the specific LNAPL remedial goals and targeted areas. It is of critical note that careful planning should be employed with regard to use of multiple technologies. Technologies should be chosen with consideration to their ability to progress toward the remedial goals. The use of multiple technologies should be thoughtful and deliberate, rather than a reaction to a failed technology. Targeted use of dual-pump liquid extraction (mass recovery technology) to reduce LNAPL saturation, followed by air sparging and soil vapor extraction (phase change and mass recovery technology) to change LNAPL composition (thus addressing risk concerns) and further reduce LNAPL mass. A final remedy might include natural source zone depletion, with adequate data collection to assess its efficacy and progress. Utilization of a barrier wall (mass control technology) to halt migration toward a receptor, followed by in situ smoldering (mass removal technology) to reduce LNAPL mass. Figure 5-3 summarizes a sequenced technology deployment treatment train that shows remedial actions from aggressive controls or removals to passive technologies (e.g., NSZD). Figure 5-3. Relationship between LNAPL State, LNAPL Concern, Technology Group, and Recoverability. As described in Section 5.4.4, the implementation of one sole remedial technology is often not practical for a timely cleanup, nor feasible for situations where there is more than one LNAPL concern. LNAPL bodies with both migration and risk concerns are common, and those differing concerns often lead to different technology selections. Many sites will require an adaptive remedial strategy that includes deliberate and timely transitioning of technologies spatially or temporally to make satisfactory progress toward, or to achieve, the remedial goals. Technology transitions are intended to compliment remedial actions that have already taken place, and should be in consideration of changing site conditions. Transitioning from one technology to another (or a combination of technologies) should not be a reaction to a failed technology. “Failed technologies” are more typically ‘failed technology selections’ due to a gap in the site understanding or a lack of complete understanding of the LNAPL concerns and the types of technologies appropriate for those concerns. To prevent failed technology selections and assess the timing for a technology transition, the LSCM should be updated regularly to improve site understanding as active and/or natural processes affect site conditions. An updated Design and Performance LCSM may be utilized to identify successes and support system shutdown, and where applicable, identify areas where there has been a shift in concern, supporting technology transition. Remedial technologies should be selected only after considering the technologies appropriate to the identified LNAPL concerns. After careful pairing of LNAPL concerns and remedial goals with appropriate technologies, the selected technology is implemented. Performance metrics for the implemented technology are evaluated during operations, which is critical to making a technology transition. The performance metrics may indicate the need for system optimization, or indicate that further progress toward achieving remedial goals is likely to be limited through continued use of the current technology. If the performance metrics indicate the practical endpoint for a technology has been met, then continued use of the technology is unlikely to move the site further toward achieving the remedial goals, and a technology transition is warranted. For each LNAPL remediation objective, one or more “performance metrics” are defined. Performance metrics are measurable characteristics that relate to the remedial progress of a technology in abating the concern. LNAPL remediation technologies address LNAPL concerns differently (e.g., excavation vs. co-solvent flushing), and therefore, the performance metrics used to demonstrate progress toward the LNAPL remediation objective depend on the technology used. Table 5-2 lists example performance metrics and remediation objectives. Asymptotic performance of optimized recovery system Analysis of unit volume of LNAPL recovery or recovery rate per unit of time, after considering optimization. Endpoint reached when asymptotic curve indicates the limit of recovery effectiveness (e.g., analysis indicates that further recovery of remaining LNAPL is impracticable). Decline curve analysis Analysis of unit volume of LNAPL recovery or recovery rate per unit of time. Endpoint reached when decline curve analysis indicates that the remaining LNAPL volume is below threshold of concern, or the time and effort to recover the remaining volume is impracticable. Dissolved-phase concentration Concentrations stable or decreasing; endpoint reached when reduced to regulatory standards at a compliance point. Dissolved-phase plume stabilized If exhibited, then it is also an indication of a stable LNAPL body. Limited/infrequent in-well LNAPL thickness Stated LNAPL thickness objective or LNAPL thickness typically not observed in monitoring well under average site conditions. Indicative that LNAPL is not consistently recoverable and the majority of remaining impacts are residual. LNAPL body footprint stabilized Assesses whether technology effectively counters existing LNAPL driving gradient and/or captures migrating LNAPL. Comparison of LNAPL body footprint before and after treatment to demonstrate stable or shrinking footprint. LNAPL composition Reduce mole fraction of volatile or soluble LNAPL constituents. Endpoint reached when volatile or soluble constituents of concern reduced to risk-based regulatory standards in media of concern. Enhanced biodegradation rate Assure remedial performance by maintaining threshold oxygen concentration in zone targeted by air sparging, soil vapor extraction, or bioventing. Endpoint reached when soil respiration rate or CO2 production declines below established threshold. LNAPL recovery rate vs. estimated LNAPL flux The recovery system either diminishes the driving LNAPL gradient and/or achieves a higher recovery rate than the estimated LNAPL flux across the width of the LNAPL body front. Endpoint reached when LNAPL flux diminishes to zero, or another target threshold. LNAPL saturation profile Comparison of saturations before and after treatment to demonstrate reduced saturations. Endpoint reached when saturation-based concerns have been abated. LNAPL transmissivity Use reduction of transmissivity over time to assess technology performance. Endpoint reached when LNAPL transmissivity indicates recovery has reached its practicable limit, or concern has been abated. LNAPL/vapor recovery ratio Ratio of unit volume of LNAPL recovered per unit volume of vapor. Decreasing ratio indicates decreasing recovery effectiveness. Endpoint reached when further reduction of this ratio is impracticable, or concern has been abated. LNAPL/water recovery ratio Ratio of unit volume of LNAPL recovered per unit volume of water. Decreasing ratio indicates decreasing recovery effectiveness. Endpoint reached when further reduction of this ratio is impracticable, or concern has been abated. No first LNAPL occurrence in downgradient well Performance metric to address/limit LNAPL migration. LNAPL never enters a monitoring well installed outside of LNAPL body. Soil saturation for soil stability LNAPL saturation reduced to yield acceptable soil bearing capacity. Soil concentrations Concentrations stable or decreasing; endpoint reached when reduced to regulatory limits. Vapor-phase concentration Concentrations reduced until regulatory standards are met at a compliance point. Unit cost of incremental mass removal Increasing cost per unit LNAPL recovered indicates decreasing cost- effectiveness (cost may not always be in line with regulatory requirements; however, in certain circumstances this metric can be useful for assessing practicable limits). Ideally, each performance metric has a measurable predetermined value that describes when the technology has reached its limits of beneficial application. That is the remediation endpoint for the technology chosen. It is important to note that the remediation endpoint is technology specific, and may not fully eliminate the LNAPL concern or achieve the LNAPL remedial goal. For example, air sparging and soil vapor extraction may be applied with the objective of changing the LNAPL composition to address risk concerns. The remediation endpoint may be a practicable mass removal rate, or a target soil respiration rate, or some other measure(s) of the beneficial limits of the technology. If risk concerns still exist when these beneficial limits have been reached, then another remedial technology is needed. A transition to another technology such as NSZD is then implemented, with the intent of fully addressing the remaining risk concerns by further reducing the concentrations of risk-driving LNAPL components in soil vapor or groundwater to levels that no longer pose a risk. The development of an Initial LCSM (Section 4) aids in the effective identification of potential LNAPL concerns. Once potential LNAPL concerns have been identified, threshold metrics, such as comparison to generic numerical screening levels, can be applied to confirm whether a potential concern can be screened out from further evaluation or consideration. SMART remediation objectives can be developed specific to the identified LNAPL concerns by establishing remedial goals, selecting one or more appropriate remedial technologies, and identifying remedial technology-specific endpoints and performance metrics. Section 6 of this document provides more detailed information to aid in the selection of an appropriate remedial technology, or combination of technologies, to meet the defined remedial goals. 1 More detailed verification of risk concerns can be made via risk assessment, which evaluates potential exposure and toxicity concerns associated with the presence of LNAPL, considers LNAPL composition, and accounts for the attenuation of mobile LNAPL constituents. Evaluation of risk is not dependent on the abatement of mobile LNAPL, and may be initiated at any point in the project life cycle.